I have a peculiar situation. I have some additional internal drives. All mounted since OS install with "Auto mount at startup" enabled. Any links or applications using the partitions (e.g. steam) fails to see the mounts until I have clicked or accessed it in "Computer" ui or navigating to it directly in a terminal. So for e.g. steam I have to exit, then go access the mount and re-open steam for it to detect the mount and my installed games. edit: it has been like this since install. Adding the partitions in there fixed the issue. However, I find it misleading that there is an option in the "Disks" utility that has an option to "Auto mount at startup". p.s. How do you mark the topic as "Solved"? 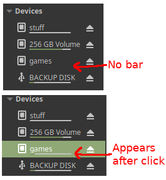 You can use the "Disks" option by selecting the drive's partition, clicking the "Gear" (Additional Partition Options), Edit Mount options, turning off the automount (I know it is counter-intuitive), then selecting "Mount at Startup", click "ok", which changes the "fstab" file for you without having to manually edit the "fstab" file. FYI: You can also change the mount locations or add mount parameter options. Ah I get it now. However, with Cinnamon it does not say "Automatic mount options", it says: "User session defaults", but I saw how the GUI changed after I manually added it to fstab so I realized how it works now.